These app makers know that when learning is fun kids will keep coming back for more! Another great app by Spinlight Studio, the makers of Tally Tots! An intuitive app with lively colors and great sounds that kids respond to. We know 2 year olds who consistently go to this app and Tally Tots. It’s a joy to see! Just Tap the Icon on the bottom right to play the ABC Song. Great practice for Kids! Kids can use one or two finger tips to place the candles on the cake. To dig for treasure guide the shovel with a fingertip. On the iPad “hammering” nails is as easy as finger taps. A carefully guided finger slide will win a goal! Opening doors is a snap with a finger tap (in the right places). Calming taps will quiet the frogs. Turning the gears is a fun move for kids-then a surprise comes up! Zapping the rockets saves the planet. Thank you for using the link above to purchase this app, and helping to support our mission – A safe resource for the best apps for your kids. Having steps to “DO” with each letter combined with sing- alongs keeps kids going for a long time. A lively way to learn the alphabet using action words to encourage like “Build a Robot!” , “Zap the Aliens”. This app keeps kids smiling and learning all at once. Educational reinforcement made fun and colorful. This app entices kids to keep coming back for more. 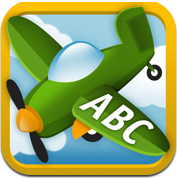 A great app in the best quality apps with the ability to entice and educate kids! What was the initial inspiration for AlphaTots? We were inspired by a lot of things — including great feedback on our previous apps from parents and teachers alike. But the biggest inspiration for AlphaTots was the success we saw with TallyTots. In March, it became the third-best selling app in education and one of the Top 100 bestselling paid iPad apps, reaching 80 in the overall U.S. charts. When you pass apps like Tetris and Ms. PAC-Man with a game made for toddlers, you know you’ve got something worth building on. So we did. And AlphaTots did even better, reaching number 2 in education and 45 overall, proving that there’s a real market for quality education apps. We like finding that one little quirk that makes our app different than something you’ve seen before. And with AlphaTots, that quirk was using verbs instead of nouns. So instead of saying “A is for apple,” we encouraged little learners to “add candles to the cake,” That’s a very different approach, and it engages growing minds in a very different way. Like TallyTots, we made an activity for each element. So AlphaTots is one game with 26 different activities packed inside, which gives kids a lot to do before they get bored. Just to expect more. We really enjoy making apps for kids, and we still have a lot of great ideas up our sleeve. So if you like what you’ve seen so far, “like” us on Facebook or join our email list at Spinlight.com for the latest news and the chance to win free promotional codes. My two year old loves this app, thanks for this little gem! Thank you Hope and take care of your little 2 year old gem!